Former Korea Baseball Organization pitcher Brandon Knight was promoted to pitching coach for his former club Monday. The Nexen Heroes announced they've brought up Knight from their minor league club in the Futures League. Knight, who pitched for the Heroes from 2011 to 2014, had been the pitching coordinator for the Heroes' Futures League club since the fall of 2015. 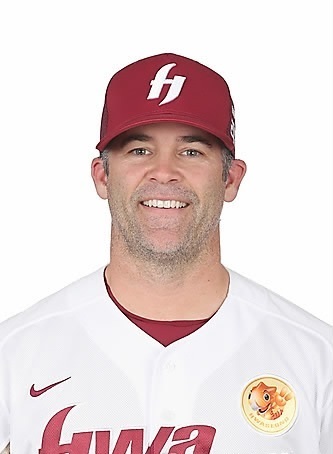 The 41-year-old American is taking over from Park Seung-min, who will now be the main pitching coach in the Futures League. The Heroes also swapped battery coaches, promoting Park Do-hyun from the minors and sending Kim Dong-woo to the Futures League. The Heroes are sitting in fifth place in the 10-team league, holding on to the wild-card spot with a 51-46-1 (wins-losses-ties) record. They're 2.5 games behind the third-place Doosan Bears. The Heroes are among the best-hitting teams in the KBO but have a middling pitching staff. They are sixth in the league with a 4.95 ERA, and opponents have hit .293 against them, the fourth-highest figure in the KBO. Earlier Monday, the Heroes traded former closer Kim Se-hyun and backup outfielder You Jae-win to the Kia Tigers for two left-handed pitching prospects.